At today's market of printing devices a large number of different models of printers have appeared that are designed to work with photos. How can we find ourselves in such wide range of machines? How can we choose the right model to meet the needs of a user? And, finally can we choose a model that combines good quality and reasonable price? In general, is it possible? The world-renowned company Epson, which manufactures printers, takes into account the user needs in the development of new models. 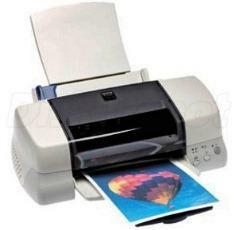 Therefore the proposed model of a photo printer Epson 870 is designed to meet your wishes. The photo printer Epson 870 of the new model has several advantages compared to similar printers in the series. These benefits are to be assessed as major breakthrough in the field of printing technology. Indeed, the combination of print speed and excellent quality of monochrome and color images is the best that can be offered to modern user. The proposed model will satisfy both amateurs and professionals. Therefore this unit вЂ“ is a great solution for not only photo studio work but also for work in a home mini photo lab. The advanced technology of borderless printing allows you to make great prints for advertising or publications. The printer Epson 870 is equipped with CISS, which will provide you with high-speed bi-directional printing in all modes. Due to the continuous ink supply system, the model of the device is very easy to operate. Now you will not have to buy new cartridges. One cartridge will be enough for the entire life of the photo printer. Your only task вЂ“ is to refill ink tank. And for refilling the printer there is no need to turn off the machine, it can be done even during its operation, what also provides additional convenience. By the way the quality of the prints is not affected by this process. Ink does not spread and become smudged. As we see, continuous ink supply system вЂ“ is a perfect addition to the printer Epson photo 870. If you are interested in the proposed model of photo printer and you have decided to buy it, you can do it right now on our website at a very competitive price. It is here that you can buy high quality printers Epson stylus photo 780 and Epson stylus photo r2880. Printer Epson 870 with continuous ink supply system вЂ“ this is where you find real savings. Every print made by you is guaranteed to be beneficial for you. CISS is perfectly safe for the running order of your printer. If you are tired of losing too much money on purchasing of original cartridges and if your printer is not equipped with CISS, we recommend you to order the system of CIS. Of course, it is better to purchase a printer with the preinstalled continuous ink supply system. This multifunction printer with CISS prints high-quality photos at low cost. Each image comes as rich and bright. Photos made with the printer of this model from Epson Company with CISS are highly resistant to light, moisture and smudging. There is no need to pay extra money for the service of photo labs any longer. Buy printer photo 870 with CISS at the best price!